By June 1809 Wellesley had forced Soult out of Portugal and was free to move against a fresh French army under Victor. Wellesley crossed into Spain and joined forces with the Spanish general Cuesta at Oropesa. The allies advanced towards Victor whose army took up a defensive position behind the Alberche river, 5km east of Talavera. An opportunity for the allies to mount a concerted attack on 23rd July against Victor's greatly outnumbered force was lost as Cuesta failed to appear. The initiative now passed to the French as Victor was joined by Sebastiani's army together with reserve troops rushed from Madrid by Joseph. Wellesley and Cuesta fell back to a defensive line on a 5km front north of Talavera. With Cuesta's army holding readily-defensible positions at the southern end of the allied line, Joseph deployed the majority of his 46,000 troops to face Wellesley's British-Portuguese army of 20,600 across the Portina brook. In the late evening of 27th July, Ruffin's division mounted a surprise attack against the Medellin hill which dominated the north of the allied line. After a frantic struggle, the attack was beaten off by Hill's 2nd Division. A second attack against the Medellin shortly after dawn the following day was also repulsed. There was now a lull in the fighting for several hours as the French command re-assessed the situation. News had reached Joseph of a move by the Spanish general Venegas towards Madrid. A decisive victory was now essential in order to release forces to counter this new threat. Accordingly, Joseph ordered a full-scale assault against the British-Portuguese line. Laval's division was the first to make contact, but was driven back by Campbell's 4th Division and infantry at the extreme north of the Spanish line. Then the divisions of Lapisse and Sebastiani - attacking in two lines separated by a few hundred metres - struck Sherbrooke's 1st Division. The leading line of French infantry recoiled, drawing Sherbrooke's men across the Portina in pursuit. Sherbrooke's infantry in turn were then sent reeling by the fire of the second French line. Wellesley now rescued a potentially critical situation by plugging the gap left by the 1st Division with detachments from the 2nd and 3rd Divisions. In a fearfully intense exchange of fire at close range, during which 10,000 advancing French infantry were faced by only 3,000 British-Portuguese, it was the French line that gave way; Lapisse himself was killed. The final act of the battle saw an attempt by Ruffin's division to outflank the allied line by attacking north of the Medellin first stalled by threats from allied cavalry then abandoned as news arrived of the failed attacks elsewhere. Even with the fighting ended, the horrors continued as grass fires swept over the wounded on the battlefield. As the sun rose the following morning, the French were seen to have abandoned the battlefield. Although Victor was left to hold the line of the Alberche, the bulk of Joseph's army retired to defend Madrid against Venegas. French casualties at Talavera totalled 7,300. Wellesley's losses of 5,400 were more than 25% of his entire force and, with a fresh army under Soult threatening to cut his lines of communication, he was compelled to withdraw his army towards Portugal and safety. Despite having been flooded at its northern end to provide a reservoir, then bisected by a motorway, the battlefield of Talavera still commands the attention of the visitor. In fact, the Badajoz-Madrid motorway NV E 90 now provides the easiest approach to the battle site, which lies just to the north of the city of Talavera. Approaching from either direction along the motorway, the imposing new monument to the battle can be seen from some considerable distance away. 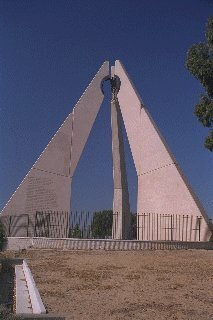 The monument is immediately adjacent to the Segurilla/Talavera exit and has its own car park. Each leg of the tripod-like monument carries a list of the units from each of the British-Portuguese, French and Spanish armies that were present on the field of battle. Nearby stands a fine map of the battle, made out of the ceramic tile for which Talavera is renowned. The view to the north of the monument takes in the Medellin hill from where Wellesley commanded the British-Portuguese forces. Unfortunately, the area of the Medellin - which includes the older monument to the battle - is now private property. By driving a short distance further north along the TO911 towards Segurilla, a distant view of the older monument can be had by looking back at the Medellin. A view of the battlefield from behind the French lines can be obtained from a dirt road off the TO904, 3.0km north of the junction with the TO911. 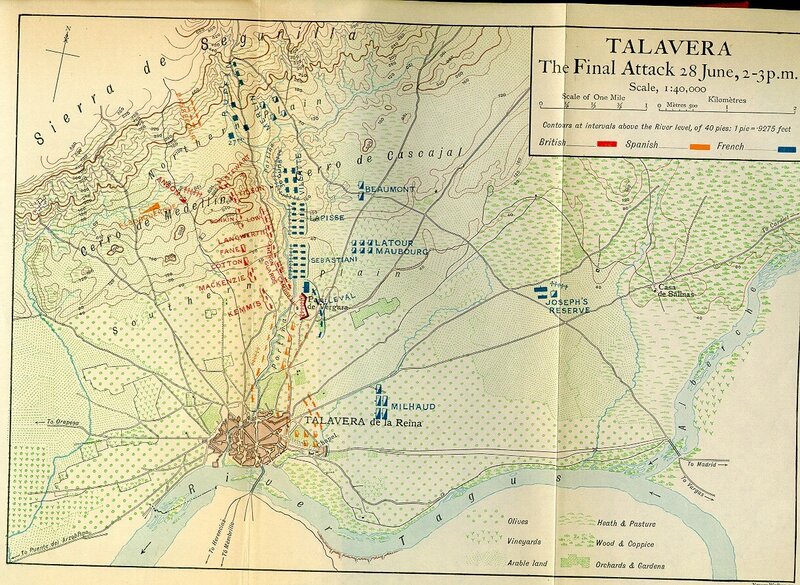 Detailed map of the Battle of Talavera courtesy of The Napoleon Series.